Our Investment Mission is to help families live their values by earning a consistent, long-term rate of return in excess of inflation, as required in their wealth plan. What stands out about 2018 is the breadth of negative returns across almost every asset class and financial market. It was a very challenging year for our globally diversified portfolios, driven by sharp declines in foreign stock markets and losses in most fixed income. (Don’t forget cryptocurrencies: Bitcoin plunged 72% for the year). A study done by Deutsche Bank in mid-November noted that 90% of the 70 different asset classes they track were posting negative returns for the year. This was the highest percentage of losers in the study’s 100-year history. We believe our portfolios are positioned to perform well over the medium to long term and to be resilient across a range of potential scenarios. We are optimistic about their potential for strong performance in the years ahead as the headwinds and trends shift. Over the short term, if the current recession fears are overdone, we expect to generate strong overall and relative returns. Outperformance should come from our foreign equity and emerging market positions. On the other hand, if U.S. stocks slide into a full-fledged bear market, our portfolios have allocations to lower-risk fixed-income and stabilizer strategies that should hold up much better than stocks. We can then put this capital to work more aggressively at lower prices that imply much higher expected returns. We would also expect managed futures funds to widen the margin of outperformance over equities they exhibited in the fourth quarter and contribute positive returns to our balanced portfolios. However, we emphasize the importance of having a long-term perspective. As your time horizon lengthens, the range of reasonable expected outcomes narrows, the shorter-term cyclical spikes and dips are smoothed out, and the underlying fundamental/economic drivers of financial asset returns play out. Over the long term, we are highly confident in the benefits of owning a globally diversified portfolio. Successful investing is a process of consistently making sound, well-reasoned decisions over time, and across market and economic cycles. We believe our diversified, fundamental, valuation-based investment approach meets this definition. Provided that we continue to execute our approach with discipline and remain patient during the inevitable periods when it is out of favor, we expect we will continue to achieve successful and rewarding long-term results for our clients. When things are not working, whether it’s our specific strategy or, like this year, investments in general, every instinct tells us to act, and the longer we resist that urge the more difficult it becomes. It’s completely normal to feel this way, and we as advisors experience it too. However, we also understand that while intuition can serve us well in some areas, in the investing world, emotions and instincts are not just unhelpful, they are typically wrong. What does underlie long-term investment success, as proven over decades and even centuries, is a well-founded discipline that provides a framework for consistency. This prevents you from succumbing to the emotions that lead people to buy and sell at or close to the worst times. We bring that discipline to the table as investment managers. Part of our role is helping you deal with the counterintuitive nature of investing, so you stay on the path toward achieving your financial goals. As always, we appreciate your trust and welcome questions. From October 2nd through the current bottom on December 24th Large Cap US Stocks as measured by the S&P 500 fell 19.19% and the Russell 2000 (Small Cap US stocks) fell 23.26%. Meanwhile Foreign Stocks as measured by the MSCI EAFE declined “only” 12.88% and somewhat shockingly to most investors Emerging Market Stocks as measured by the MSCI Emerging Markets index fell a mere 7.60%. This was not all this shocking to us however, as Emerging Market Stocks entered the 4th quarter already being fairly cheap and thus have a “higher floor”. The Stabilizers we use were mixed but ended up positive during the period with managed futures down 4.93% while Gold was up 6.65%. Finally, Defensive was up just slightly at around 1% overall. In summary, a typical “middle of the road” portfolio we manage was only down ~¼ that of the US Stock Market and ~½ as much as a typical 60/40 portfolio (60% Large Cap US Stocks and 40% Core US Bonds). In other words, it performed just about as well as we could have imagined due to Stabilizers and Defensive performing their respective jobs well and our overweight to Foreign Stocks and Emerging Market Stocks contributing to a smaller loss in Growth. We made a couple of minor shifts in our Asset Allocation this quarter. This included increasing our holdings of Large Core, Small to Mid Cap and Emerging Markets due to a valuation drops hitting triggers and eliminating Global Bond for now due to the particular manager not adhering to a Defensive mandate. Value-oriented managers struggled continuing a multiyear trend we have commented on before. 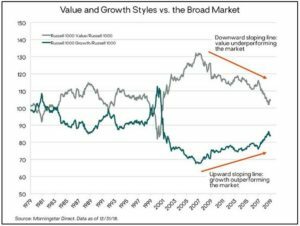 By some measures, the disparity in performance of growth versus value stocks is now at an extreme not seen since the peak of the tech stock bubble in 2000. We don’t believe this divergence is sustainable. We believe that like most market cycles, this one will turn again (but the precise timing is uncertain and unknowable). The analogy of a rubber band only being stretched so far before it snaps back is a good one. We believe value investing remains a sound and profitable long-term investment approach. 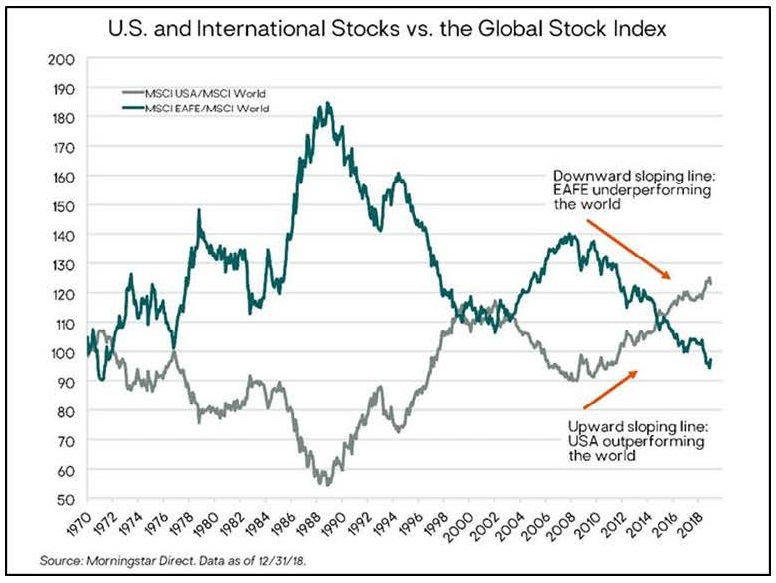 The multiyear period of U.S. stock market outperformance versus the rest of world is also reaching an extreme relative to history. We don’t believe this trend is sustainable either. The last 10 years’ performance is likely not going to repeat over the next 10 years. 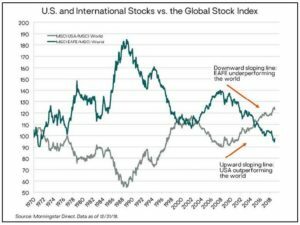 As with value investing, we don’t believe global equity investing is dead or destined to perennially underperform the U.S. market. And as noted above, during the market rout in the fourth quarter there were some glimmers that this cycle may be in the process of turning, with EM stocks outperforming the S&P 500 by seven percentage points and developed international stocks performing in line with U.S. stocks. Certain material in this work is proprietary to and copyrighted by Litman Gregory Analytics and is used by The Advocates with permission. Reproduction or distribution of this material is prohibited, and all rights are reserved.